Williams is an athletic and versatile forward who does all the dirty work on the court. Not a great shooter or scorer but has elite level athleticism and should improve his outside shot over the years. Out of this world athleticism. Can run and jump with the best of them and shows great hustle and determination. 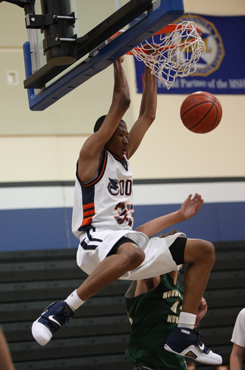 Long arms and great hops allow him to grab rebounds and block a ton of shots. Plays a lot in the paint right now but is beginning to expand his game to include some looks from the perimeter. Runs the court as well as anyone in the country and finishes above the rim. A standout defender who uses his length and quickness to guard just about any position on the court. Not a natural scorer and doesn't project as a go to guy on the offensive end. Sometimes gets lost on the court and disappears too often. Needs to work on his ball handling and outside shooting.